As I sat under an umbrella trying to shelter from the icy February rain, I started to wonder whether this was all worth it. Sitting on a wet plastic chair at the side of the road, huddling a cup of tea that had long ago lost its warmth, is not really my idea of fun. 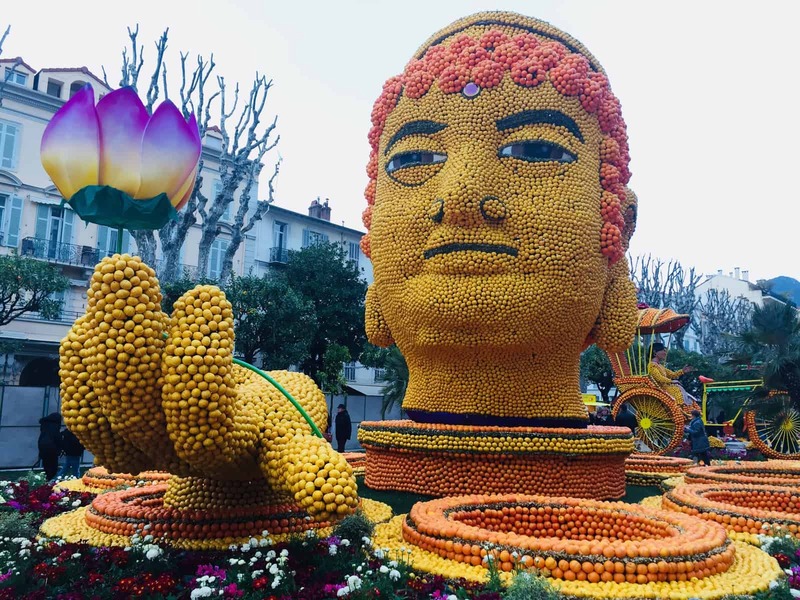 But I needn’t have worried – at 2.30pm sharp, loud music erupted and the floats taking part in Menton’s Fete de Citron (Lemon Fete) parade began snaking their way through the town’s streets, transforming the drab grey day into a colourful celebration of life. The Fete is an annual event held over a two-week period in February. 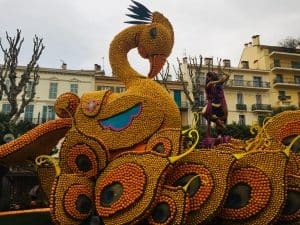 It takes place in Menton, a small town on the Cote d’Azur in France (known colloquially as The Pearl of France) and just a few miles from the Italian border. It has a different theme every year: 2018 was Bollywood. 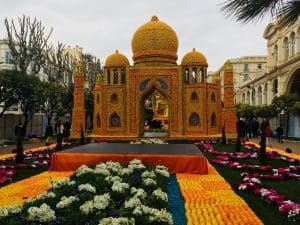 There is a programme of events that cover the fortnight’s festivities, but as we were only visiting for a night, we chose to visit the Exposition des Motifs d’Agrumes and then watch the Sunday afternoon parade. The Exposition is an impressive display of what can only be described as “fruit monuments”. You have to pay to enter the area, which is enclosed from the surrounding streets by high walls. This only adds to the sense of anticipation. Once inside, the monuments can soar 20-30 feet into the air. The use of lemons (and oranges) is presumably a nod to the abundance of citrus fruit grown locally, the result of a warm micro-climate. 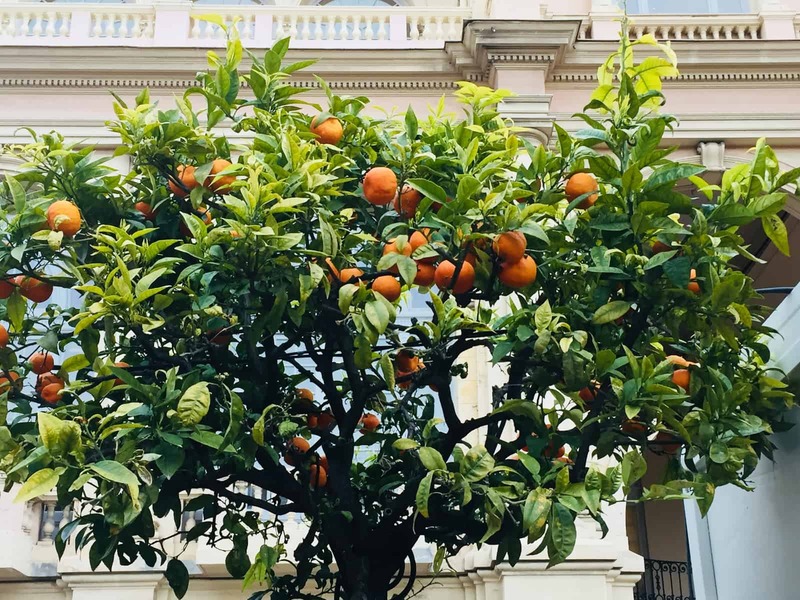 It’s hard to miss the fruit weighing down the trees as you wander through the streets in the town. 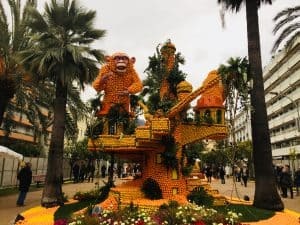 The Bollywood theme meant that the Exposition was filled with snakes, elephants, swans, tigers, monkeys and Buddas, all painstakingly assembled with hundreds, if not thousands, of oranges and lemons. There was even a Taj Mahal of fruit! Seeing these up close was a bit surreal – I’d never seen anything like it before – and I was staggered by the incredible effort that had clearly gone into each “monument” (having uttered this out loud, one local informed me that it takes about a month of work to design and assemble the entire set of displays and that it’s a real community effort; at the end of the fete, however, the locals benefit from being able to fill whole trolleys full of the citrus fruit for just one euro!). 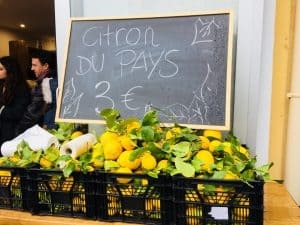 You can spend as long as you like wandering around and there are a few stalls along the side where visitors can sample some of the local produce, such limoncello that is made from the local fruit. This part of the Fete really has to be seen to be believed, but really only whets the appetite for the parade – the Corsos des Fruits D’or (Golden Fruits Parade) – that wends its way through the main streets on the Sunday afternoon. The parade lasts around two hours. It is a fantastic burst of energy, colour and sound, and was a welcome relief given the cold, wet weather. The floats were a colourful mix of more orange and lemon Bollywood-themed figures (more monkeys, swans and tigers! 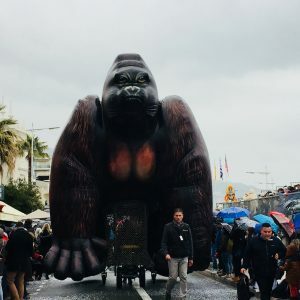 ), alongside dramatic towering inflatables (there was a King Kong and a humongous spider, which made me wonder whether they’d recycled some floats from the previous year’s Hollywood Movies theme….). In between were troupes of colourful dancers and orchestral bands, waving large plumes of feathers or sparkly jewelled headdresses to the beat of Indian music and showering the crowd with confetti. The colours were phenomenal – yellows, oranges, blues and purples – and the buzzing atmosphere a great antidote to the wind and rain. 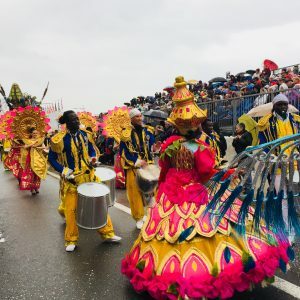 By the end of parade, it was true that we were a little bit cold and sodden, but the vibrant colours, the energising music, and excitement of the parade more than made up for that and it was impossible to come away without feeling a bit uplifted. I thoroughly enjoyed our short trip to the Fete. 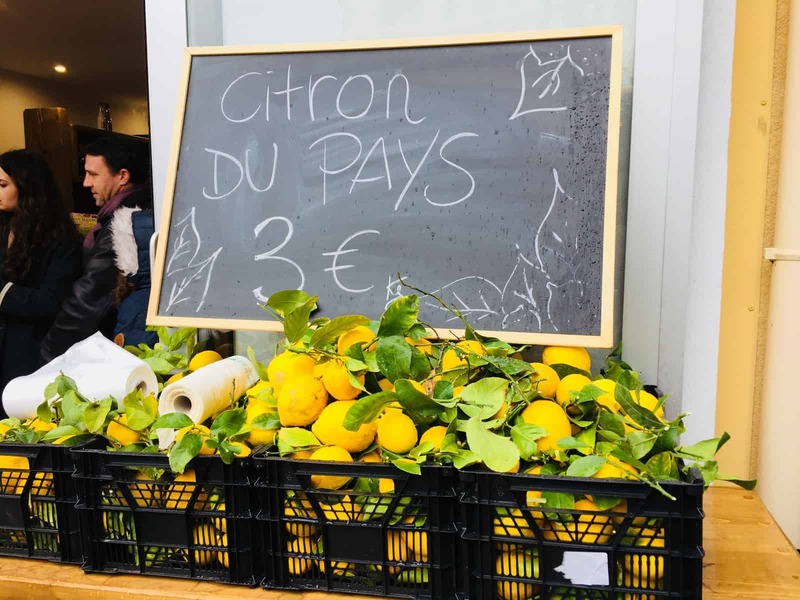 If you like France, quirky and unusual festivals, and of course, lemons, you’ll love this! The Fete de Citron 2019 will be held between Wednesday 20th February and Sunday 3 March. 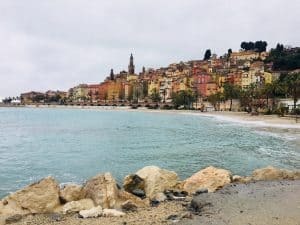 We flew to Nice and picked up the train near the airport for a 40-minute ride to Menton; you can also take a bus from the airport, which takes a bit longer at around 60 minutes. As Menton is only a small town, both the bus and train terminals are right in the centre. Entrance to the Exposition is 12 euros. You also need to pay 12 euros to see the parade, as the route is cordoned off and you have to enter through designated entrances. It pays to go in early, but if I was going again, I would pre-book one of the restaurants along the route – so if you similarly happen to experience a cold and wet day, you can enjoy the parade from the comfort and warmth of an internal vantage point. 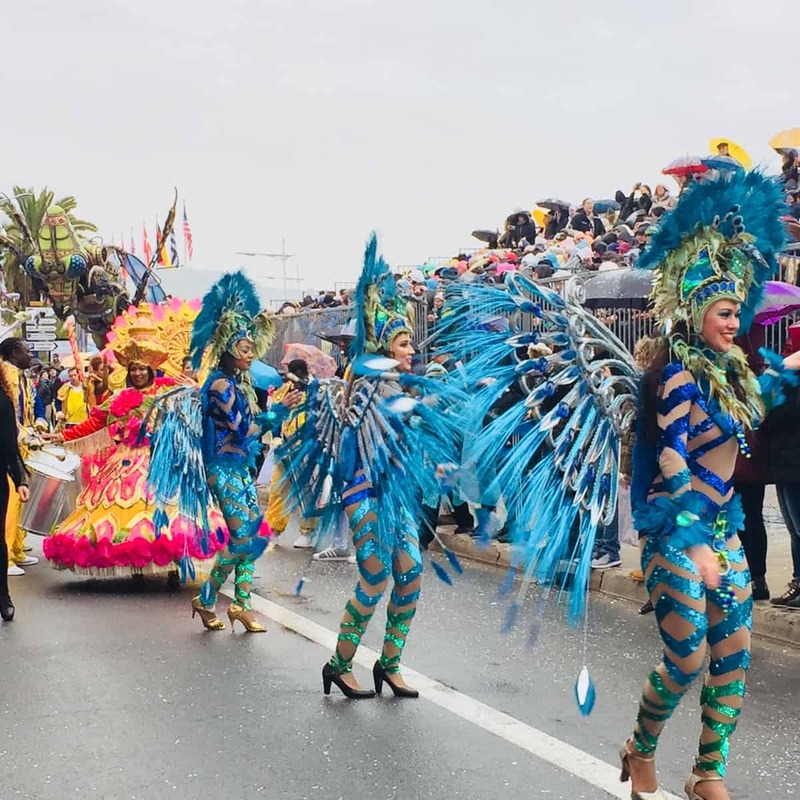 There are also other events that take place, depending on when you are in the town – for example, night time parades. Other than visiting for the events held each year, Menton is a fantastic town to explore. It has plenty of character, and enough to keep intrepid travellers occupied for a weekend. There’s an art museum – the Musee Jean Cocteau – as well as a large casino on the seafront. There is also a smattering of great restaurants to grab a seat in and watch the world go by, as well as leisurely walks along the coast. Being the final town in France before the Italian border, it’s incredibly easy to pop across for the day, for example, to San Remo, which I would highly recommend. Monaco is also only a 20-minute train ride away. sharing. This is a place to discover France.